Agnes Caroline Thaarup Obel (born 28 October 1980) is a Danish singer, songwriter, and musician. Her first album, Philharmonics, was released by PIAS Recordings on 4 October 2010 and was certified gold in June 2011 by the Belgian Entertainment Association (BEA) after selling 10,000 Copies. At the Danish Music Awards in November 2011, Agnes Obel won five prizes, including Best Album and Best Debut Artist. Citizen of Glass, her third album, received the IMPALA Album of the Year Award 2016. Agnes Obel's song "Riverside" was featured on the Spike TV series The Mist in Season 1, Episode 2, “Withdrawal“. "Riverside" has also been featured on Grey's Anatomy, Ringer, the British TV show Lovesick, the Australian comedy-drama Offspring, and the Danish series, The Rain, in Season 1, Episode 2.” Her song "Familiar" was featured on an episode of the German TV series Dark, the video game Dark Souls III: The Fire Fades Edition trailer and is the theme song to the Canadian TV series Cardinal. Agnes Obel was born in Gentofte, Copenhagen. She and her younger brother, Holger, grew up in an unconventional environment, with a father who had three children from another marriage. He loved to collect strange objects and instruments. Her mother, Katja Obel, was a jurist and musician and she used to play Bartók and Chopin on the piano at home. Agnes learned to play the piano at a very young age. About her learning, she says: "I had a classical piano teacher who told me that I shouldn't play what I didn't like. So I just played what I liked. I was never forced to play anything else." During her childhood, she found inspiration in Jan Johansson's work. Johansson's songs, European folk tunes done in a jazzy style, have been a strong influence on her musically. Obel has lived in Berlin since 2006 with photographer and animation artist Alex Brüel Flagstad, who filmed and directed the music videos for "Riverside" from Obel's debut album Philharmonics (2010) and "Dorian", "The Curse", and "Aventine" from Aventine (2013). Agnes Obel debuted as a solo singer with her first album Philharmonics (2010). She wrote, played, sang, recorded, and produces all the material herself. "The orchestral or symphonic music never interested me. I always was attracted by simple melodies, almost childish. (…) I put a long time before writing texts because the music seems to tell already a story, to project images." According to Obel, her piano is much more than an instrument: "The piano and the singing are two equal things to me – maybe not inseparable but very connected. You can say they are like two equal voices." She has said that, "The music is the most obvious means to express what I am, where I am." All of the songs on Philharmonics are original work except "Close Watch" ("I Keep A Close Watch" by John Cale) & "Katie Cruel" (a folk traditional; as the iTunes bonus track of the album). In Live à Paris, released on 11 April 2011 on iTunes, she sings a cover of Elliott Smith's "Between The Bars". Furthermore, Obel did a duet with Editors singer Tom Smith, performing "The Christmas Song" by Mel Tormé – to be found on the Smith & Burrows album Funny Looking Angels (released in November 2011). Philharmonics has garnered generally positive reviews with, for example, James Skinner from the BBC saying that "the compositions... are slow, sombre, sepulchral even, but not without a sense of occasionally singular beauty". In the French cultural magazine Les Inrockuptibles, Johanna Seban speaks about a "disarming purity" and states, "There is, in these deeply melancholic ballads, the clearness and reassuring nobility of bedside discs." In Musicomh, Ben Edgell writes that Agnes Obel "sings with a hushed and tender grace that waxes wistful and serene over yearning cello, harp, and piano vignettes. She's a fey siren, with a dusky, near-whispered vocal that speaks to Ane Brun or Eva Cassidy." French journalists have called her "A revelation to follow". Obel's first album was also a commercial success. In March 2011, she appeared for the first time in the United States. At the South by Southwest (SXSW) music festival in Austin, she performed all the songs on the album. Three songs from the album were on the soundtrack of the 2009 film Submarino (Riverside, Brother Sparrow, and Philharmonics). "Riverside" was featured in the episode "Not Responsible" of Grey's Anatomy, in Episode 12 of the second season of Offspring, in the episode "Duplicity" from Revenge, and in the episode "What Are You Doing Here, Ho-Bag?" from The CW's Ringer. "Avenue" was played in the episode "Trust" from Revenge. "Fuel to Fire" was used in the episode "The Big Uneasy" of The Originals. In April 2011, the Danish group Lulu Rouge released a remixed version of "Riverside". Keeping the track's original beauty, Lulu Rouge added their special electronic tempo. Prior to the release of "Philharmonics", the soft, soothing tunes of "Just So" were used as the soundtrack of a commercial for Deutsche Telekom on German TV in 2008. PIAS Recordings released a Deluxe Version of Philharmonics on 7 February 2011. The Deluxe Version contains five more tracks. Two instrumentals ("Riverside" and "Just So") and three live songs: "Over the Hill", "Just So", and the new track "Smoke & Mirrors". On the Riverside EP, Obel sings "Sons & Daughters". This track is only available on the EP. In June 2011, Philharmonics was certified gold by the Belgian Entertainment Association (BEA) after selling 10,000 units. In February 2011, her first album was nominated for the 'Impala European Independent Album of the Year' and the song Riverside (from the Submarino's soundtrack) won the Robert Award for the Best Song of the year 2011. In October 2011, Obel won the 2012 European Border Breakers Award. The prize celebrates the top new talents in European pop music who "have all succeeded in reaching out to audiences beyond their home country through their talent and energy." In November 2011, she won five prizes at the Danish Music Awards for her first album Philharmonics. She won Best Album of the Year, Best Pop Release of the Year, Best Debut Artist of the Year, Best Female Artist of the Year, and 'Best Songwriter of the Year. In January 2013, Obel started mixing her new album. On 20 June 2013, she revealed that the new album, Aventine, would be released on 30 September 2013. On Aventine, Obel commented: "I recorded everything quite closely, miking everything closely in a small room, with voices here, the piano here – everything is close to you. So it's sparse, but by varying the dynamic range of the songs I could create almost soundscapes. I was able to make something feel big with just these few instruments." Frank Eidel from quebecspot.com, commented: "It's a fascinating collection of remarkable pieces, with rich and intense arrangements supported by Obel's dazzling voice." The web site Mushroompromotions said: "‘Aventine’ is a beautiful record, intriguingly unhurried. If the first record was a wander through the forest, this one takes the time to see the beauty and feel the texture in a single leaf. It is at once microcosmic and universal. (...) Agnes creates her own world, or as she calls it, a bubble or bell jar, to make her music. Once inside (or should that be outside? ), she's no longer conscious of what's going on. This is the mystery of her modus operandi, something she cannot explain. Which simply adds to the ethereal quality of her music." In October 2014 a deluxe edition of Aventine was released. This album featured 3 new songs. The deluxe edition also contains a remix of 'Fuel to Fire' by David Lynch, who commented: "I loved doing this remix. I was turned onto Agnes’ music through my record label... I think she has a most beautiful voice and can do things with her voice that are unique and extraordinary." In October 2014, Agnes Obel played for the first time in L'Olympia in Paris. During her 2014 tour, Agnes Obel began work on her third album: "I’m planning to work less with piano, and more with other kinds of old keyboards (...) I’m trying to find new instruments to work with, so it’s sort of on the research phase and starting to write things." She also said: "I have some clear ideas but I’m not sure it is a good idea to go into specifics on such an early stage. I mainly plan to work with old keyboards like spinet and harpsichord and then see where they take me." In June 2015, Obel began recording the new album. She recorded strings with new musicians Frédérique Labbow, Kristina Koropecki, and John Corban. In June 2016, she released the single 'Familiar', from the upcoming album. The song was recorded, produced and mixed by Obel and features the violin by John Corban as well as cellos by Kristina Koropecki and Charlotte Danhier. The music video was directed by Obel's husband Alex Brüel Flagstad. Hugo Cassavetti from Telerama, wrote: "Agnes Obel, while remaining true to her fine style, expands her new musical fields. Percussions with a loud power rhythm a delicately acrobatic melody that the singer performs with a voice that was strangely moved. Yes, Obel, as split by technology, duets with her disturbing echoes with a male stamp." In July 2016, Obel announced her third studio album, Citizen of Glass, to be released on 21 October 2016. Regarding the mysterious title, Obel explains: "The title comes from the German concept of the gläserner bürger, the human or glass citizen. It’s actually a legal term about the level of privacy the individual has in a state, and in health it’s become a term about how much we know about a person’s body or biology or history – if they’re completely made of glass we know everything." In addition to violins, cellos, harpsichords, a spinet, and a celesta, Obel used a Trautonium, a rare electronic musical instrument from the 1930s. In September 2016, Obel released a new single, "Golden Green". In Dansende Beren, Niels Bruwier writes: "The sound of glass is never far away. The song is about the way we always find other better lives than ours(…)she brings out her dreamy voice, it’s actually just the perfect classic pop song without embellishment. Enchanting, elysisch and paradise-like." In October 2016, a new song from Citizen of Glass was released: 'Stretch Your Eyes'. This song is a new version of an older one ('Spinet Song') which was played during her tour in 2014. In October 2016 Citizen of Glass came out. The French newspaper La Croix wrote: "With several great songs, the surrealist Stretch your eyes or the luminous Golden Green, Agnes Obel has created a sumptuous, odd and modern album. Citizen of Glass confirms, with greatness, Agnes Obel as an important pop artist." Citizen of Glass received an average score of 81 on Metacritic, meaning universal acclaim, based on 7 reviews. Citizen of Glass received the IMPALA (The Independent Music Companies Association) Album of the Year Award 2016, which rewards on a yearly basis the best album released on an independent European label. In February 2018, Agnes Obel was signed to Deutsche Grammophon. The contract involved Deutsche Grammophon joining forces with Blue Note for North American releases. Mr Trautmann, president of Deutsche Grammophon, said: "We are fascinated by Agnes’s compositional autonomy and the precision with which she creates and produces her vocal and instrumental soundscapes. With every song and instrumental piece, she opens up small universes, thus reaching a broad audience with sophisticated works. With Agnes we share confidence in the long-term success of artistic excellence and credibility, as well as the intention to inspire many more fans around the world”. In May 2018, Obel contributed to Late Night Tales with a series of tracks selected by the artist herself. For this compilation, Obel presented various titles by very different artists. Music by Michelle Gurevich, Nina Simone, Henry Mancini, and Alfred Schnittke is included on this album. Obel says: "I was surprised at how much time I ended up spending on this. I collected all the songs together with my partner Alex and we just spent time listening to records, trying to see what would fit together. Some of the music I’ve included here is on mixtapes we made when we were just friends as teenagers." Obel combined new works with the original song "Bee Dance", a haunting reading of the Danish song "Glemmer Du", and a new version (the third one) of "Stretch Your Eyes" called "Ambient Acapella". The first single, Inger Christensen’s "Poem About Death", is set to original music by Agnes Obel. On the topic of the haunting cover of Arvid Muller's "Glemmer du", Agnes Obel explains: "In Denmark, the song is best known in the version from 1932, sung by the actor and singer Liva Weel. It's one of my favourite melodies. The song is about the impermanence of time and love, with memories being the only thing you get at the end. (...)I recorded it using analog tape and then running the tapes again, so it sounded old and re-recorded, playing with this feeling of remembrance and of lost time." Obel is influenced by artists such as Roy Orbison and also by the French composers Claude Debussy, Maurice Ravel, and Erik Satie. She also likes Edgar Allan Poe and photographers Sibylle Bergemann, Robert Mapplethorpe, Tina Modotti, and Alfred Hitchcock. Concerning Hitchcock, she says, "I adore his enigmatic style, his sophisticated esthetic but always with an extreme simplicity." The cover of her first album, photographed by Berlin photographer Mali Lazell, is an 'homage' to The Birds. Obel also likes the experimental filmmaker Maya Deren. Sometimes, Obel tests some of her demos on Deren's movies. Obel is also a huge fan of Nina Simone: "I have a fantastic live album by Nina Simone on which she sings “Who Knows Where the Time Goes”. Her vocals seem to come out of nowhere. Magic." In addition to classical music, Obel listens to artists like Mort Garson (The Zodiac – Cosmic Sounds), The Smiths (How Soon Is Now? ), and Françoise Hardy (Où va la chance). In February 2017, and after her covers of John Cale and Jeff Buckley songs, Agnes Obel performed "Hallelujah" in a tribute to the late Leonard Cohen at the 'Victoire de la Musique 2017'. ^ Cornet, Philippe (5 May 2011). "Il faut laisser la mélodie décider du texte". FocusVif. Archived from the original on 8 May 2011. ^ "Agnes Obel wins IMPALA European Independent Album Of The Year award". Musikweek.com. Retrieved 20 March 2017. ^ "Drengen der gik baglæns on IMDB". IMDb.com. ^ Nachrichtenfernsehen, n-tv. "Scheue Schönheit aus dem Norden: Agnes Obel singt uns eine warme Decke". N-tv.de. ^ "Agnes Obel Interview". Planetnotion.com. ^ a b Millecamps, Matthieu (13 September 2011). "La Grâce naturelle de Mademoiselle Obel". Nordeclair.fr. ^ Edgell, Ben (4 October 2010). "Agnes Obel Philharmonics". Musicomh. Archived from the original on 21 December 2010. ^ "Agnes Obel schedule". Schedule.sxsw.com. 2011. Archived from the original on 11 January 2012. Retrieved 25 February 2011. ^ "Ringer Music". Cwtv.com. 8 February 2012. ^ Berri, Fat (26 April 2011). "Agnes Obel's Riverside by lulu rouge remix". Fatberris.com. ^ "Impala European Independent Album of the Year". Impalamusic.org. 30 January 2011. Archived from the original on 13 May 2011. Retrieved 23 February 2011. ^ "Nominerede personer 2011". Filmakademiet.dkj. 1 March 2011. Archived from the original on 19 July 2011. Retrieved 1 March 2011. ^ "European Border Breakers Awards 2012". 5 October 2011. Archived from the original on 17 January 2012. ^ "Facebook post by Agnes Obel". Facebook.com. 31 December 2012. Retrieved 13 January 2014. ^ "Facebook post by Agnes Obel". Facebook.com. 20 June 2012. Retrieved 13 January 2014. ^ "Agnes Obel: understated elegance on her second album 'Aventine' - France 24". France24.com. 1 October 2013. ^ "Agnes Obel Announces New Album 'Aventine' Released 30th September 2013". Contactmusic.com. ^ "Le concert d'Agnes Obel à l'iTunes Festival à voir en intégralité". Telerama.fr. ^ "Aventine, le nouvel album d'Agnes Obel, disponible le 1er octobre". Quebecspot.com. Archived from the original on 13 December 2013. Retrieved 24 September 2013. ^ "Aventine, en avant première". Lesionrocks.com. ^ "Agnes Obel – Aventine (Out Friday, September 27th 2013)". Mushroompromotions.com. ^ "Fuel To Fire (David Lynch Remix)". Agnesobel.com. ^ "Obel at the Olympia". Spinintheblackcircle.fr. ^ Dutt, Madelyne. "9:30 INTERVIEW: Anges Obel". 930club.tumblr.com. ^ "interview Agnes Obel". Hungertv.com. ^ "New album on the way - UPDATE June 27th". Agnesobel.org. 7 June 2015. Archived from the original on 9 July 2015. Retrieved 13 January 2015. ^ "FAMILIAR – THE NEW SINGLE". agnesobel.com. 29 June 2016. Retrieved 30 June 2016. ^ Cassavetti, Hugo. "Regardez le nouveau clip d'Agnes Obel". Telerama.fr. ^ Frometa, RJ (12 July 2016). "Agnes Obel Announce New Album, "Citizen of Glass"". Ventsmagazine.com. Retrieved 12 July 2016. ^ "Agnes Obel on Stay Loose". Agnesobel.org. Archived from the original on 8 July 2015. Retrieved 7 July 2015. ^ "Nieuwe single Agnes Obel – "Golden Green". Dansendeberen.be. ^ "Citizen of Glass by Agnes Obel". Metacritic.com. ^ "Deutsche Grammophon signs Agnes Obel". Completemusicupdate.com. 26 September 2018. ^ "Late Night tales". Ventsmagazine.com. April 2018. ^ "Agnes Obel explains her tracks". Npr.org. ^ "Agnes Obel : Découvrez ses artistes fétiches". Aufeminin.com. ^ "Mali Lazell Web site – Portfolio : Tempers Of Nature". Malilazell.com. ^ "Agnes Obel on Qobuz". Youtube.com. ^ Zonderman, Tom. "Agnes Obel adds shades to the darkness". Agendamagazine.be. Archived from the original on 22 December 2015. Retrieved 29 October 2013. ^ "BYT Interviews: Agnes Obel". Brightestyoungthings.com. ^ "Agnes Obel Performs Hallelujah In Homage To Leonard Cohen – Victoires de la Musique 2017". Cohencentric.com. ^ "ARIA CHART WATCH #392". Auspop.com.au. 29 October 2016. Retrieved 29 October 2016. ^ "Certificeringer" (in Danish). IFPI Denmark. Retrieved 6 February 2018. ^ "Agnes Obel Platinum in France". PIAS Recordings. 27 April 2011. Archived from the original on 22 July 2011. Retrieved 20 May 2011. ^ "Les certifications". snep. Retrieved 3 August 2018. 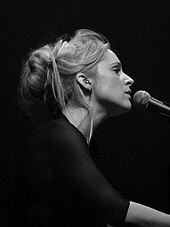 Wikimedia Commons has media related to Agnes Obel.